The Spott Hogg Hogg It is an American made, multi pin sight by Spot Hogg that offers excellent adjustability and performance. Its weight is around 10.5 ounces and is made of only the highest quality materials and components. 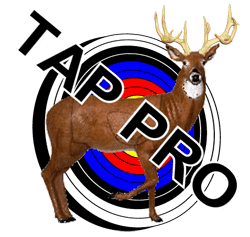 Once installed and mastered, this rest will aid any shooter in becoming as accurate as possible. The 2nd axis adjustment allows the archer to set the sight (pins) plumb with the bow. The 3rd axis adjustment allows the archer to fine tune the perpendicular angle of the sight ring so when shooting uphill and downhill, the bubble and bow both stay plumb with each other. 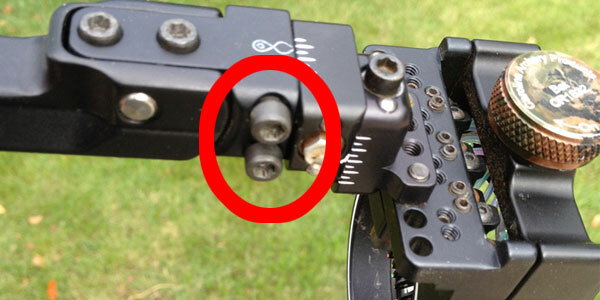 At the end of the sight arm are the vertical and horizontal adjustment screws. 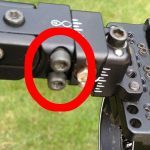 In my opinion, these adjustment mechanisms are some of the best on the market. To adjust and micro adjust the Spot Hogg Hogg It’s sight ring, all you need is one allen wrench. The adjustment screws (vertical and horizontal) are stationary and move the sight ring in small increments which allow precise adjustments which can be measured against hash marks printed on the sight. 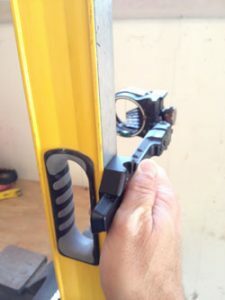 The sight ring attaches to the sight’s arm via two allen screws. There are four adjustment positions in which the sight ring can be moved closer to or farther from the riser via a predrilled spacer. 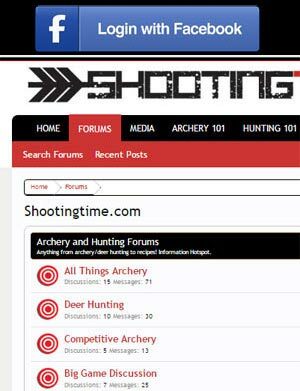 This is nice due to the fact that many different bows require different centershot settings for their arrow rests. The same two allen screws have multiple options or tapped holes which allow adjustments of the vertical location of the sight ring. The sight ring contains the pins (5 or 7 pins), a level, and a vertical aiming wire which allows for quicker adjustments. The pins are available in the following sizes: .010, .019, .029, and .039. To adjust the pins individually, there are 3 screws. Each pin has two screws in the frame of the sight ring which controls the vertical adjustment. Each pin also has a rear mounted screw which adjusts the in and out distance (left and right adjustment while facing the sight at the drawing position). Other than the Spot Hogg Hogg It’s durability, the adjustment systems on the sight are some of the best on the market. Gone are the days of loosening a screw and having the entire sight freed from binding friction and moving loosely. Now, by turning the gang or sight ring adjustment screws, the pins move exactly where you want them to. All movements can also be controlled by observing the marks on the adjustment mechanism which is a huge plus. You can add bells and whistle too if you’d like. You can buy the sight ring wrapped (fiber optic wrapping around the sight ring in order to catch light) which really helps keep the pins illuminated in low light conditions. You can also install a light which will illuminate the pins in complete darkness. This sight is a homerun. If anything does happen to this sight, Spot Hogg will fix it and ship it back to you at no charge. The quality and performance of this sight along with Spot Hogg’s excellent reputation is the reason why I give the Spot Hogg Hogg It a 9.5 out of 10 star rating. Some of the highest quality pins on the market. When wrapped, the illumination of the pins is excellent. Excellent phone support and online manuals/help. Spot Hogg does not offer a camo version of this sight.